Holidaymakers at Henllys love the place – for its history (one-time home to the High Sheriff of Anglesey, and a Franciscan friary); its location (a great jumping-off point from which to explore the island); its views (down to Beaumaris and its eponymous Castle, and across the Menai Strait to Snowdonia); and its facilities, including an 18-hole County-standard golf course. Halfway to being a links course, when you think about it. That same body of water laps a shore not too far distant, on a sunny day lending a certain sparkle to ‘a good walk, spoiled’. But, without engineering, without far-sightedness, there would arguably be no Henllys, and not much of a Beaumaris either. It took technology to bring Anglesey to life. Theoretically it is possible to ford the Strait in the ‘Swellies’ stretch, during low-water spring tides when the water’s depth may fall to around 18 inches. However, at these times a strong current is running: around five knots, making the passage extremely difficult, not to mention dangerous. Elsewhere in the Strait the minimum depth is never less than 6½ feet. That it must have been possible to cross, by boat or (hazardously) on foot, is not in question; the existence of Beaumaris Castle alone, built in the late 13th and early 14th Centuries, bears testament to that. 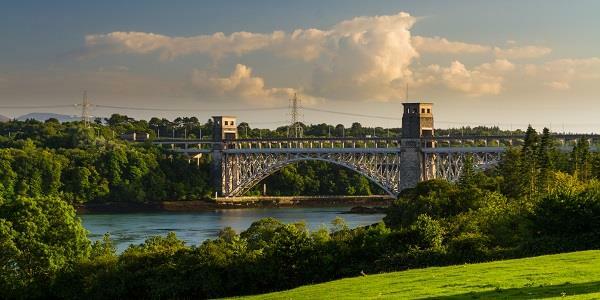 But that we can visit Anglesey so easily today is down to two wonders of engineering: Thomas Telford’s Menai Suspension Bridge and Robert Stephenson’s Britannia Bridge. And in a roundabout way, we have the Irish to thank – for both. In 1800, Ireland joined the UK through the Act of Union. This meant that the numbers of people (important people, crucially) wishing to cross the Straits rose, as politicians commuted to and from Ireland to Parliament in London, sailing between Dublin and Holyhead, on the ‘far’ side of the island, and then travelling by road to and from the capital. The politicos had no wish to get their feet wet, never mind risk life and limb, and so used their clout to press for a permanent link. 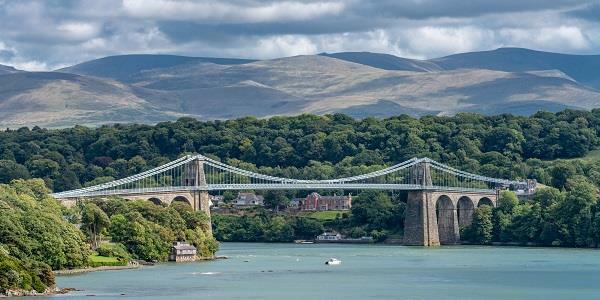 Begun in 1819 and opened on 30th January 1826, spanning the Strait at its narrowest point, Thomas Telford’s Menai Suspension Bridge was a triumph of civil engineering – the biggest suspension bridge in the world at the time. Sixteen huge chains supported 579 feet of deck, allowing 100 feet of clear space below so that tall ships could pass beneath. Improvements have been made over the years. The roadway was widened in 1840, and stiffening trusses installed; the wooden surface was replaced by a steel deck in 1893; and in 1938 the original wrought-iron chains were replaced with steel ones in order to cope with the increasing weight of freight traffic. But the Menai Suspension Bridge remains a thing of beauty, its elegant lines as iconic as Beaumaris Castle or the Welsh dragon. The Britannia Bridge perhaps lacks the grace of the Menai Suspension Bridge, but was just as forward-thinking in its way. As rail travel became increasingly popular in the mid-19th Century, it was deemed necessary for a rail link across the Menai Strait – once again primarily for the convenience of those commuting MPs. A second bridge across the Strait was commissioned. As with its stylish neighbour, the bridge’s span needed to be at least 100 feet above the high-water level to allow tall ships to move underneath. It also needed to support two railway tracks. Robert Stephenson rose to the challenge. The construction of the Britannia Bridge was started in 1846 and completed four years later, in March 1850. After much consideration, the favoured design incorporated three supporting towers, two main spans of 460 feet between the outer towers and the central one, and two additional ‘tower-to-shore’ spans of 230 feet, each comprising giant wrought-iron rectangular tubes – two for each span, one for the outward and one for the returning railway line. By creating a tubular system, the forces acting on the bridge were dissipated and the bridge retained its structural integrity. The Britannia Bridge remained in use and was claimed to be the most easily maintained railway bridge in the UK, until 1970 when it caught fire. It was not until four years later that normal rail services to and from Anglesey were resumed, and by then the bridge had changed radically in character. The tubes were no longer used. The central tower was removed, and an arch was added between the remaining towers to support the deck. Finally, in 1980, a road deck opened above the railway lines. Of course, use of the bridges is not (and never was) reserved solely for high-ranking politicians. It meant islanders could earn a living through trade with the mainland. It meant access to a wider world: healthcare, education, job opportunities. And it meant the wider world could visit the glorious island of ‘Ynes Môn’. In a word, tourism. Whether your journey to and from Anglesey is by road or rail, spare a thought for Messrs Telford and Stephenson: engineering visionaries, without whose efforts long ago a holiday on Anglesey today would be nigh on impossible!